The sooty shearwater (Ardenna grisea) is a medium-large shearwater in the seabird family Procellariidae. Ardenna was first used to refer to a seabird by Italian naturalist Ulisse Aldrovandi in 1603, and grisea is medieval Latin for "grey". In New Zealand, it is also known by its Māori name tītī and as muttonbird, like its relatives the wedge-tailed shearwater (A. pacificus) and the Australian short-tailed shearwater (A. tenuirostris). It appears to be particularly closely related to the great shearwater (A. gravis) and the short-tailed shearwater, all blunt-tailed, black-billed species, but its precise relationships are obscure. In any case, these three species are among the larger species of shearwaters that have been moved into a separate genus Ardenna based on a phylogenetic analysis of mitochondrial DNA. Up close, the chocolate-coloured plumage can be appreciated. Sooty shearwaters are 40–51 cm in length with a 94– to 110-cm wingspan. It has the typical "shearing" flight of the genus, dipping from side to side on stiff wings with few wing beats, the wingtips almost touching the water. Its flight is powerful and direct, with wings held stiff and straight, giving the impression of a very small albatross. This shearwater is identifiable by its dark plumage, which is responsible for its name. In poor viewing conditions, it looks all black, but in good light, it shows as dark chocolate-brown with a silvery strip along the center of the underwing. Sooty shearwaters breed on small islands in the south Pacific and south Atlantic Oceans, mainly around New Zealand, the Falkland Islands, Tierra del Fuego, and in the Auckland Islands and Phillip Island off Norfolk Island. They start breeding in October, and incubate their young for about 54 days. Once the chick hatches, the parents raise their chick for 86 to 109 days. They are spectacular long-distance migrants, following a circular route, traveling north up the western side of the Pacific and Atlantic Oceans at the end of the nesting season in March–May, reaching subarctic waters in June–July, where they cross from west to east, then return south down the eastern side of the oceans in September–October, reaching to the breeding colonies in November. They do not migrate as a flock, but rather as individuals, associating only opportunistically; in June 1906, for example, two were shot near Guadalupe Island off Baja California, Mexico, several weeks before the bulk of the population would pass by. Likewise, the identity of numerous large, dark shearwaters observed in October 2004 off Kwajalein in the Marshall Islands remain enigmatic; they might have been either sooty or short-tailed shearwaters, but neither species is generally held to pass through this region at that time. In the Atlantic Ocean, they cover distances in excess of 14,000 km (8,700 mi) from their breeding colony on the Falkland Islands (52°S 60°W) north to 60 to 70°N in the North Atlantic Ocean off north Norway; distances covered in the Pacific are similar or larger; although the Pacific Ocean colonies are not quite so far south, at 35 to 50°S off New Zealand, and moving north to the Aleutian Islands, the longitudinal width of the ocean makes longer migrations necessary. Recent tagging experiments have shown that birds breeding in New Zealand may travel 74,000 km in a year, reaching Japan, Alaska, and California, averaging more than 500 km per day. In Great Britain, they move south in late August and September; with strong north and north-west winds, they may occasionally become "trapped" in the shallow, largely enclosed North Sea, and heavy passages[clarification needed] may be seen flying back north up the British east coast as they retrace their path back to the Atlantic over northern Scotland. The sooty shearwater feeds on fish and squid. They can dive up to 68 m deep for food, but more commonly take surface food, in particular often following whales to catch fish disturbed by them. They also follow fishing boats to take fish scraps thrown overboard. In New Zealand, about 250,000 muttonbirds are harvested for oils and food each year by the native Māori. Young birds just about to fledge are collected from the burrows, plucked, and often preserved in salt. Its numbers have been declining in recent decades, and it is presently classified as near threatened by the IUCN. In 2009, the harvest reported record-low catches, on average a trapping cage yielded nearly 500 birds; in 2009, the number was estimated to be closer to 40 per cage. 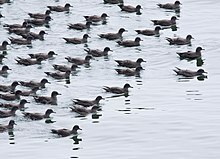 On August 18, 1961, the Santa Cruz Sentinel reported that thousands of crazed sooty shearwaters were sighted on the shores of North Monterey Bay in California, regurgitating anchovies, flying into objects, and dying on the streets. The incident sparked the interest of local resident Alfred Hitchcock, along with a story about spooky bird behavior by British writer Daphne du Maurier, helping to inspire Hitchcock's 1963 thriller The Birds, a cautionary tale of nature revolting against man. The film is now ranked among the American Film Institute's top-10 thrillers of the last century. ^ a b BirdLife International (2012). "Ardenna grisea". IUCN Red List of Threatened Species. Version 2013.2. International Union for Conservation of Nature. Retrieved 26 November 2013. ^ Jobling, James A (2010). The Helm Dictionary of Scientific Bird Names. London: Christopher Helm. pp. 40, 54, 179. ISBN 978-1-4081-2501-4. ^ Heidrich, Petra; Amengual, José F. & Wink, Michael (1998). "Phylogenetic relationships in Mediterranean and North Atlantic shearwaters (Aves: Procellariidae) based on nucleotide sequences of mtDNA" (PDF). Biochemical Systematics and Ecology. 26 (2): 145–170. doi:10.1016/S0305-1978(97)00085-9. ^ Austin, Jeremy J.; Bretagnolle, Vincent & Pasquet, Eric (2004). "A global molecular phylogeny of the small Puffinus shearwaters and implications for systematics of the Little-Audubon's Shearwater complex". Auk. 121 (3): 847–864. doi:10.1642/0004-8038(2004)121[0847:AGMPOT]2.0.CO;2. ^ Penhallurick, John & Wink, Michael (2004). "Analysis of the taxonomy and nomenclature of the Procellariiformes based on complete nucleotide sequences of the mitochondrial cytochrome b gene". Emu. 104 (2): 125–147. doi:10.1071/MU01060. ^ Rheindt, F. E. & Austin, Jeremy J. (2005). "Major analytical and conceptual shortcomings in a recent taxonomic revision of the Procellariiformes – A reply to Penhallurick and Wink (2004)". Emu. 105 (2): 181–186. doi:10.1071/MU04039. ^ a b c McGonigal, David (2008). Antarctica: Secrets of the Southern Continent. Buffalo, NY: Firefly Books. p. 220. ISBN 978-1-55407-398-6. ^ Thayer, John E. & Bangs, Outram (1908). "The Present State of the Ornis of Guadaloupe Island" (PDF). Condor. 10 (3): 101–106. doi:10.2307/1360977. ^ Live Science. "Hitchcock's Crazed Birds Blamed on Toxic Algae". Livescience.com. Retrieved on 2013-04-03. ^ American Film Institute. Afi.com. Retrieved on 2013-04-03. ^ Kudela, R.; et al. (2005). "Harmful Algal Blooms in Coastal Upwelling Systems" (PDF). Oceanography. 18 (2): 184–197. doi:10.5670/oceanog.2005.53. Gillson, Greg (2008): Field separation of Sooty and Short-tailed Shearwaters off the west coast of North America Birding 40(2): 34–40. Wikimedia Commons has media related to Puffinus griseus. Sooty shearwater – Species text in The Atlas of Southern African Birds.